Back by popular demand, this holiday takes you to one of the world’s most beautiful locations. Stay in a village of white-painted cottages, surrounded by orchards, and discover a unique landscape of sheer mountainsides, forests, lakes and pristine glaciers. Few places in the world can match the spectacle. Flights also available from other UK airports – Birmingham, Bristol, Cardiff, Dublin, Durham Tees Valley, Humberside, Leeds Bradford, London City, London Gatwick, Manchester, Newcastle & Norwich – click here for more information on available dates and prices. 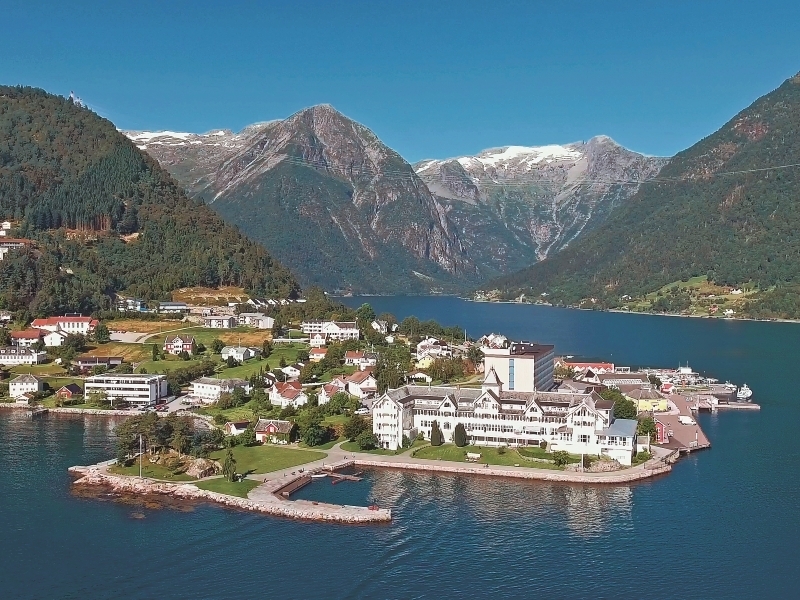 Fly to Bergen, meet your Tour Manager and transfer by coach through the spectacular scenery to the idyllic village of Balestrand. Settle in to your room, and acquaint yourself with the beautiful surroundings, before enjoying your first dinner in the hotel. Today, get to know Balestrand. Since the late 19th Century, Sognefjord has welcomed visitors searching for clear mountain air and enchanting scenery, and whenever you go, the area’s natural beauty will enchant you, as will the warmth of the welcome virtually everywhere you go. Your first included excursion is an unforgettable day trip by boat to the historic trading port of Bergen. Join us to discover a city of cobbled streets and medieval houses with a colourful harbour and open-air fish market. Stroll past the wooden warehouses of Bryggen and take the Floibanen funicular up ‘Mount’ Floyen. The Jostedal Glacier – mainland Europe’s largest ice-flow – is a mesmerising sight that dominates the northern landscape beyond the fjords. Our optional visit here is a great opportunity to see the glacier itself and to explore the informative Norwegian Glacier Museum. Our optional Norway in a Nutshell excursion is an unmissable tour of one of the world’s most scenic regions. The day includes a ride on the world-famous Flamsbana line from Myrdal to Flam – a remarkable 20km descent down the steep-sided valley – and a spectacular two-hour cruise through Aurlandsfjord and Naeroyfjord to the tiny port of Gudvangen. Spend today’s optional excursion exploring beautiful Sognefjord and the fascinating Sogn Folk Museum at Kaupanger, with its fine collection of fishing and ‘ice’ boats that reflect Norway’s age-old interaction with the sea and the fjords. Spend your final day in Balestrand relaxing as you make the very most of the village and its surroundings. This evening, enjoy a final dinner in the hotel at the end of an unforgettable week in one of the world’s most beautiful corners. Transfer back to Bergen airport, and check in for your flight home.